To the Letter :: Come see me in Allen! The first one was so fun, why not do another? 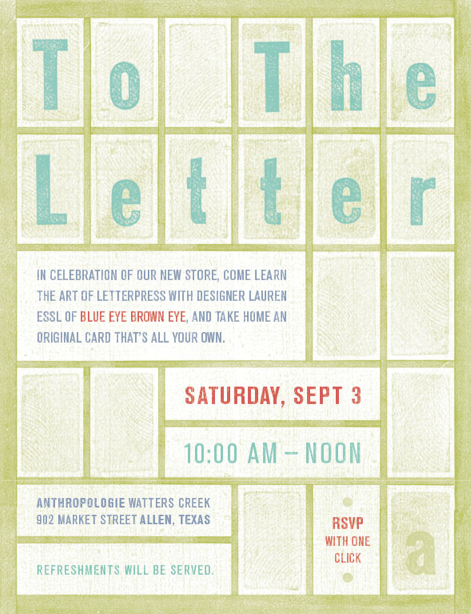 On Saturday, September 3rd I’ll be doing another letterpress event to help celebrate the opening of the brand new Anthropologie in Allen, Texas! We’ll make thank you cards that you’ll get to take home with you and you’ll learn all about the art of letterpress printing. Bring your friends and spread the word! Oh, and it’s free! I was just googling letterpress in Fort Worth, and I am totally freaking out that I might be able to do this in the morning!